"She hung-up on us! She actually went and hung-up on us! Her own sisters!" Maddie cried dramatically, waving her arms around and then pretending to faint. Dallas launched and hit her on the stomach with the nearest pillow. "Oh don&apos;t be so melodramatic, Maddie!" She chuckled. "Melon-de-what?" Maddie asked, confusion etched on her face. Dallas burst out laughing, laying down on her back next to Maddie. "No, stupid! Not melondramatic, melodramatic!" She explained, still laughing. "Oh," Maddie said. A look of understanding now appearing. "Well what on earth does that mean?" "Well, I basically just told you to stop being such a little drama-queen." Dallas teased, poking her sister in the ribs. This resulted in a huge tickle fight between the two girls, until they were to tired to tickle anymore. "Hey, Dal?" Maddie said, trying to catch her breath back. "Can you tell Demi to play nice next time? 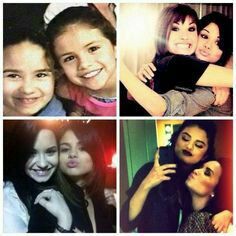 I&apos;d really like to actually meet my cousin, before Demi kills her!" Meanwhile, Demi was staring at the TV. She hadn&apos;t realized what Kesha was watching before. She had been watching home videos. Demi remembered giving Kesha different videos for her birthday. Her Mum used to film a lot, so that all their memories were taped. Demi watched the screen and smiled, remembering the day well. It was of her playing with Selena and Kesha. "Demi, Demi, Demi!" Kessie sang, skipping up to her happily. "Hey there little one," Demi cooed. "What&apos;s the matter?" "Aunty Diana says Selena&apos;s coming over today!" She squealed excitedly. "That&apos;s right, she&apos;s coming to play." Demi said, picking Kessie up and spinning her around. "Selena, Selena, Selena!" Kessie chanted, wriggling around in her arms. "Selena&apos;s coming to play, Selena&apos;s coming play!" Demi laughed out loud as she watched. Her, Selena and Kesha were all dressed up in Dallas&apos; clothes. Dallas was chasing them, she had never really liked them borrowing her things. Especially without asking! Suddenly, Kesha walked back into the house. "What are you doing?" She asked, stammering a little as she spoke. Demi looked up and her, not knowing what to say. "Why are you watching that?" Kesha asked, glancing from the TV to Demi. "That&apos;s private," Kesha snapped and switched the screen off. "Hardly," Demi pointed out. "Remember, I&apos;m in it. Plus, I gave them to you!" Kesha didn&apos;t answer and simply grabbed all the videos, running upstairs with them. The second she entered her room, she put them all back into their box and padlocked it. Demi walked in, sitting down on the bed, just after she hid the box. "Maddie wants to meet you, you know..." Demi said quietly. "And Dallas wants to see you again too." Kesha just ignored her and carried on tidying her bedroom. Silence invaded the room, only being broken by Demi&apos;s inquiring voice. The silence getting to much for her. "Why do you hate me?" She asked, watching Kesha. "What?" Kesha mumbled, barely paying attention. "I said, why do you hate me?" Demi retreated, stronger this time. "I never said I did," Kesha shrugged rudely. "But you didn&apos;t have to," Demi pointed out. "Even an idiot can see that you hate me. It&apos;s written all over your face!" Kesha pun around and glared at Demi. You could clearly see hate in her eyes, almost as if it was shooting Demi in the stomach. "Figure it out, Demi." She growled. "You&apos;re a smart girl. It&apos;s your own fault anyway..."
Then she stormed out of the room again. Demi stood up and yelled after her. "You can&apos;t keep pushing people away, Kesha!" She cried, her voice beginning to get louder as Kesha ran faster. "THERE WON&apos;T BE ANYONE LEFT FOR YOU TO PUSH!" Demi put her head in her hands and groaned. Who knew Kesha would be this difficult!